Before arthritis (also known as the time period B.A. ), I used to go to the Family History Center in Oakland once or twice a month. I spent many hours pouring over the microfilm for Achada, Nordeste, Sao Miguel Island, Azores. I had a mystery to solve and the answer was in those microfilms. I had found all but one of the children of Ana Jacinta de Melo and Jacintho Pacheco in Achada. I found Ana’s family in Achada. I found Jacintho’s family in Fenais da Vera Cruz (Fenais d’Ajuda). But, I could not find Ana’s baptismal. I could not find Jacintho’s baptismal or death record. I could not find their marriage record. And, I could not find their oldest son, Antonio’s, baptismal record. I searched nearby towns to no avail. I exhausted the Achada baptismal microfilm without finding Ana or Antonio. I was stuck. I had all the surrounding documents. But, those basic documents alluded me. I began to form hypothesis about the family. Antonio was adopted. Ana and/or Jacintho were married multiple times. Ana and Jacintho never got married. They were born in other villages, possibly Algarvia, which is a surname the Pacheco’s took on after 1900 in California. They had changed their names because the story that Ana had killed off five husbands was really true. I had many hypothesis, but no answers. Around 2000, my arthritis seeped into my neck and shoulder. The motion of turning a microfilm reader handle or simple sitting and staring for hours and taking notes was getting to be too difficult. I had to give up going to the Family History Center and rely on online records. Well, I waited. 12 years to be exact. Just this weekend I found out that the village I needed, Achada, had been digitized and was online. I couldn’t wait to get started! So, I spent bits and pieces of three days going frame by frame through the Achada baptismals. I worked from 1833 back to 1827 when Ana’s parents were born. I didn’t find Ana but I found a couple more of her siblings. I thought I might have messed up because for awhile I found myself looking for Jacinta instead of Ana. This was just like working on a microfilm reader. Page by excruciating page. I finished one group. Then, I worked the other direction from 1833-1835. I was on my last page (well, about my fifth last page). And, there she was! 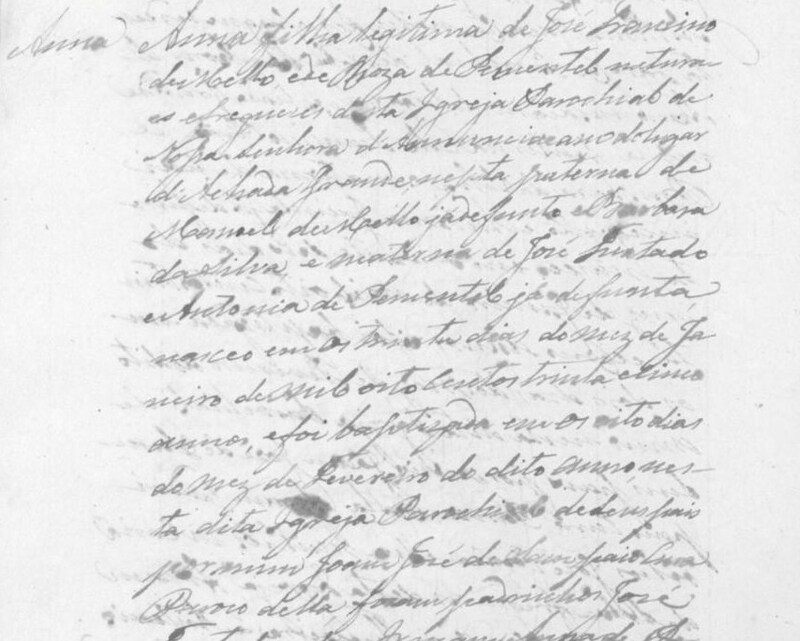 In 1835, I found Ana’s baptismal record. She did exist!!! I haven’t translated the record yet. Right now, I’m just admiring its beauty. I can now give Ana a real birth date instead of 1827-1840. I can add her Godparents. I now can search for a marriage record knowing that Ana was 20 years old in 1855. That would be 8 years before her first documented child. How satisfying it is! This is the reward for searching relentlessly for years and never giving up. I now have my Great Great Grandmother’s baptismal record! congratulations on your breakthrough! It’s a wonderful example how we benefit from all these online resources. I look forward to reading how your search continues. Thanks Yvette! I’m so grateful for those who help to digitize records and put them online. Without them, my research would be very limited.